Home › Philosophy › And What a Year It’s Been – Happy New Year! My news feed was filled with everyone’s smiling photos and canned, “It’s been a great year!” captions, that it was hard to escape. I was constantly prompted to share my equally great year. But I never clicked the share button. My year, after all, was far from great. This was the year of cancer. The year of depression and drugs. It was the year of surgery and biopsies and waiting. It was a year of fear and tears and the unknown. It was definitely not the kind of year that should be shared on Facebook. But after pestering me daily, I finally clicked on my Facebook year, and I found something interesting. It wasn’t a completely terrible year. It was the year of my daughter’s sweet 16 and the year my other daughter got into college. It was the year of our trip to Disney and Islands of Adventure. It was the year of being surrounded by friends, of being so happy every day I went to work at my new job, and a year where I found new friends who felt as comfortable as my old friends. It was the year I discovered Sherlock. It was a year of turmoil, yes, but a year that taught me a great deal – about family, about friendship, about community. And about my own strength. 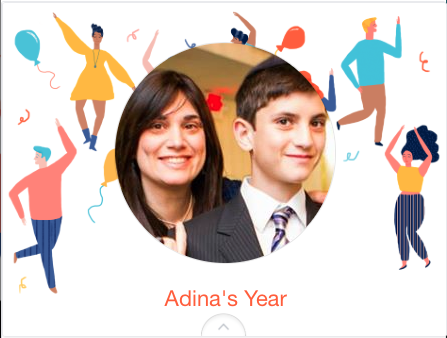 My Facebook year conveniently ignored two months of my life and instead highlighted the smiling photos of me and my family. It reminded me about how much good there had been in a year mixed with so much bad. That still holds true. This year more than ever. May this coming year be filled with happiness, love, good friends, and good books. May you remember to let the good moments between the storms envelop and carry you. And may you be blessed with the knowledge that, in most instances, you will be fine. I had a very similar FB Year in Review experience! Here’s to a bright and beautiful 2015. That was awesome Adina, you ROCK!